1910! Yesterday I met up with a dollmaker and we got to talking and turned out we have both made her. I have quite a lot of porcelain dolls I have made from the very beginning and I loved that time in my life - I had just retired after living 30 years in remote mining towns and it was a big thrill to have all things arty at my disposal. Of course, I had been warned quilting would take over, but I always know best, no, of course not - yes, of course it did. 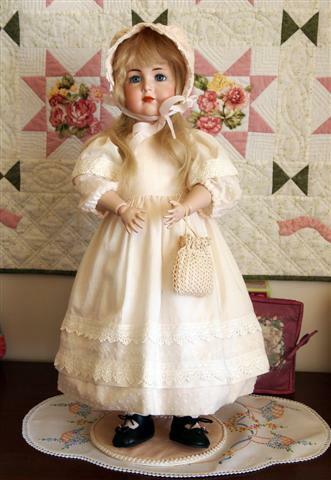 This sweetie has human hair, glass sleep eyes, little leather shoes, two petticoats and rows and rows of crochet around her dress, bonnet, little crocheted handbag and quite a lot of embroidery on her petticoats, too. The crochet thread was so fine - 80 or 100, I'm not too sure now, it all seems such a long time ago! Wouldn't you love to have a twin brother who gave you this with a nice monetary gift for your birthday - our dear one Danielle and David tuned 36 earlier in the week - oh, what precious years they have been! 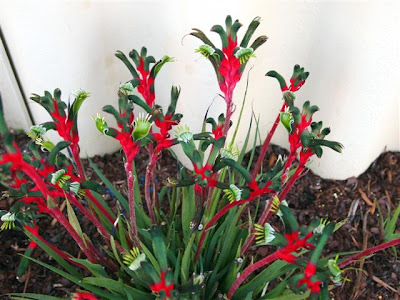 I may have mentioned before that David is the best gardener I could ever have - these Kangaroo Paws are the floral emblem of Western Australia and are really loving the warm sunshine. For Miriam of Yellow Roses - I think of Miriam every time I have yellow roses in bloom - hi, Gorgeous Girl! Just the binding to trim back and stitch down - thanks Robin! - Robin machined on the binding for me as I'm still pretty wonky on the machine - some things don't matter, but I would be so upset to spoil this quilt. I am eager to have a nice stitchy weekend so let's hope it comes to fruition - for those with the same plans good luck - hope everyone has a lovely weekend! Such lovely things for memories, Family and friends are precious Love your post! Oh Lurline, that is great news for you and your DH, I bet it's all things bright and beautiful inside and out! My goodness, how many of us have made the little sweetie Mein Leibling - I've probably spelt that wrong. I know that when I made mine there were 6 others being made in the studio at the same time. She was and is very popular. 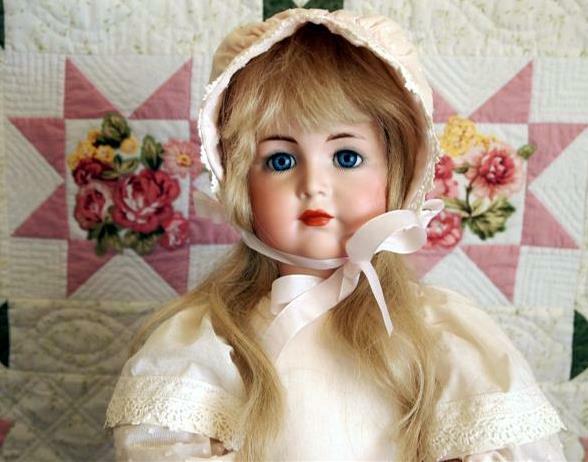 Beautiful doll and what a lovely quilt. You have a lovely weekend as well and happy stitching! That is fantastic news, Lurline! I'm so glad for you and your hubby, what a relief! I too, have a very old German doll. It was in a wooden chest stored under an old Queenslander house. We were helping an old couple have a clean up (about 25years ago now). I have had her restored. Happy birthday to your twins! Your lovely doll is just so gorgeous and so wonderful that you made her yourself!! And lovely lovely flowers for the birthday girl - and in your garden! Kangaroo Paws are one of my very favourite flowers - they so speak to me of what it means to be Australian - tough and hardy, but gorgeous and unique and a little odd looking to show that sense of humour! Lurline that is fantastic news....I am just so happy for you both.....time to celebrate....your doll is gorgeous and all the flowers are just so lovely...I hope you and your DH enjoy your weekend..
Lurline, I'm thrilled for you. Wonderful news and just in time to really enjoy a fabulous weekend. Go for it. Hi, Beautifull doll, it´s very lovely. I like much the flowers!!!! That is great news about your DH!! So Glad to hear it is Good News!..Hope you Both Enjoy a Relaxing & Stress Free Weekend...Your Doll is just Gorgeous. Lurline, That is just fabulous news!! I am sure that is just a weight off both of your shoulders! Great news about your husband! Beautiful doll (she looks like you!). i love the Kangaroo Paws plant! I'm so glad about your news! Whew! I didn't know you made dolls -- OMG! That is one amazing doll!! Awwww thank you, Lurline!!! My roses are still a few weeks away from blooming. Beautiful to see your flowers. Wonderful news about your DH. You and your whole family must be very relieved! Your doll is exquisite!! All that beautiful hand work! Happy birthday to Danielle and David. I too hope you have a lovely weekend of stitching! Yay!!! So glad it's good news! Have an excellent weekend! So glad about your good news. Now you can enjoy your days ahead. Love your pictures and particularly love the blue and white quilt. Wonderful News, Gorgeous doll and flowers and that quilt - you need to show it a few more times. Yes, I am hoping for some finishes this weekend too! Hope yours has lots of happy stitchy moments. Isn't benign a wonderful word! Congrats to you and to hubby -- enjoyed sharing in your news. I'm so happy that you received good news. Waiting certainly puts life on hold, doesn't it? 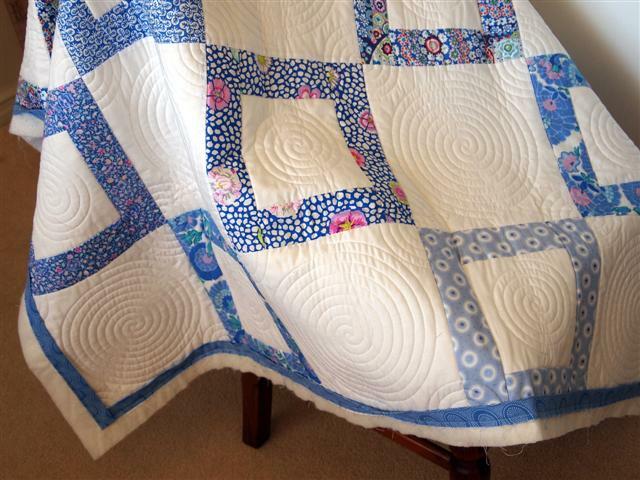 Your doll and the dress are truly lovely, and your new quilt is a knockout! Glad to hear all is well with your DH. Beautiful quilt! Wonderful news about Ed Lurline...oh, I'm so happy for you all. The sun is shinning all around...enjoy and relax with some stitching time now..
Love your porcelain doll and that quilt is just so beautiful.. Your doll is just exquisite!! I know you are breathing easier now with the wonderful news about DH. Enjoy a worry free weekend. lovely pictures to see this am as I get back to reading my favorite blogs. I am totally in love with your doll and the lovely quilt. Wonderful news for you and your DH..I am so happy for you both. Your doll is just beautiful! That is fantastic news from the specialist - what a relief for you both! Your Kangaroo Paw is magnificent. 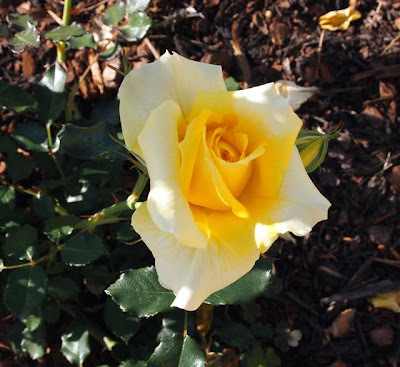 We have a few growing here but have a lot of trouble, for every one that flowers, another one dies. 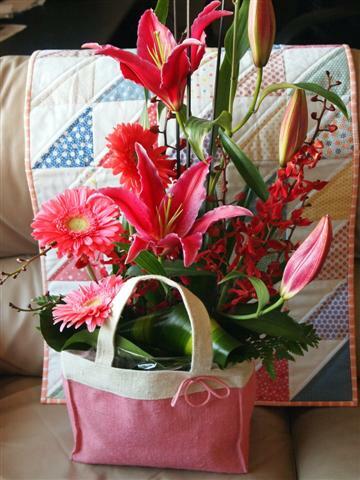 Your doll, flowers and quilts are beautiful but your news is priceless. I can feel you dancing with joy at your good news. So happy for you and your husband. Have a fabulous rest of the weekend and a great beginning to your week. I'm so happy that you got such good news. Definitely cause for celebration. Thank you for sharing your news, your beautiful creations and your garden. Fabulous news and so glad you are able to put that worry behind you. Love the doll...I have a celluloid doll which I should probably sell.......before I leave this mortal coil and all that. I think it was Mum's. Trouble is I would not know where to start. Maybe I should start by dragging her out of a cupboard and dressing her. HOORAY for the WONDERFUL news!!! Twinkle toe dance of glee, Lurline!! !